China needs to demonstrate “reciprocity” if it wishes to act as a superpower. 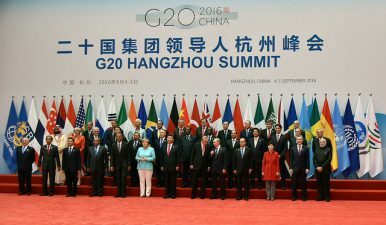 The G20, held on September 4–5 in Hangzhou, China, was hailed as a great success by the Chinese media. Certainly, from the Chinese government’s perspective, the summit went comparatively smoothly. From Beijing’s viewpoint, China succeeded in setting the agenda for this G20. That is, China successfully kept the focus on economic and financial questions and away from political issues. With this year’s G7 raising the South China Sea issue and the Permanent Court of Arbitration ruling against Beijing, China was wary that the dispute would be raised at the G20. However, the G20 had its origins in 1999 as a meeting of finance ministers and central bank governors from 20 major economies, before being upgraded to a summit of leaders of the world’s 20 major economies after the global financial crisis of 2008. The G20 summit is formally referred to as the G20 Leaders’ Summit on Financial Markets and the World Economy. In this respect, the fact that host China set an agenda focusing on the road to economic development, the world economy and financial stability was not enough to arouse strong suspicion among member countries. Also, in terms of China’s partitioning of its diplomacy, whereas the BRICS summit has both political and economic elements to its agenda, the G20 was simply an opportunity to talk about the economy. However, for the administration of Chinese President Xi Jinping, there was value in using this G20 as an opportunity not only to burnish its relations with the international community but also to put on a show for the home crowd. A situation where the international community supports China, indeed respects it as a “responsible great power,” and does not raise the issues China wishes to avoid was certainly necessary for China’s home crowd ahead of the looming National Congress of the Communist Party of China. The fact that the G20 agenda was confined to economic and financial issues and matters such as political and security concerns could not be discussed may have benefitted China in one respect. In another respect, though, it prevented China from showing itself as a major political force. Of course, it may be that China at least managed to save face as the world’s second largest economy. However, even in economic terms, China’s position is vastly different from its position when the G20 summit meetings first started. This is in part because, after the global financial crisis, China was the engine of global growth. Indeed, emerging market economies were driving the global economy, so much so that the G20 seemed the appropriate forum to discuss the future of the global economy. Later, however, emerging markets began to experience their own economic slowdowns. China was no exception, and these days even poses a downside risk to the global economy. China’s overproduction of steel and reforms of state-owned enterprises in particular have drawn worldwide attention. At the recent G20, Beijing decided to sweep away these concerns and make various promises to the world. China may capitalize on these international commitments to push ahead with reforms but it could also find it difficult to fulfil these international commitments, which may turn into shackles. How China Deals With Japan and the U.S.
China’s main diplomatic objective this year was to make a success of the G20. For this reason alone, it went to great lengths to put on a show. Starting from early August 2016, more than 200 fishing boats and Chinese government vessels repeatedly sailed on the pretext of a patrol in the sea surrounding the Senkaku Islands. While these actions are open to various interpretations, Beijing was reportedly very unhappy with Japan’s response to the collision between a Chinese fishing boat and a Greece-flagged merchant ship. Then, from late August, the “preparations” for the G20 summit began, with talks between the Chinese and Japanese foreign ministers and a visit to China by Japanese national security council chief Yachi Shotaro. These measures can also be seen as steps basically designed to ensure that the Japanese did not bring up political disputes such as the South China Sea issue at the G20. The government of Japanese Prime Minister Shinzo Abe also understood China’s position on this and did not raise the South China Sea dispute or other contentious issues at the G20. Needless to say, the way China deals with the U.S is different from the way it deals with Japan. The U.S. is the world’s leading power, respected by China. Even on the South China Sea issue, the U.S. has adopted both hard and soft tactics. The talks between U.S. President Barack Obama and Chinese President Xi Jinping took a form that reflected this hard/soft duality. In their first discussions about global issues such as the Paris climate change agreement, they shook hands smiling, while in their second talks on the South China Sea issue, they confronted each other with stony looks. Cooperation in the global space and confrontation in the space that is East Asia…this was an occasion that truly reflected U.S.-China relations as they are today. However, now that the G20 is over, China is expected to step up its activities in the South China Sea, and there were signs of this around the time of the summit. Actions like these could alter the balance between these hard and soft tactics. On the other hand, what was slightly bizarre from a Japan perspective was that Beijing was so intent on making the G20 a success that it tightened security, encouraged the people of Hangzhou to travel out of town during the summit, and shut down any kind of activity – including economic activity – on the days of the summit. Of course, all countries tighten security for international conferences, but surely none go as far as preventing a whole town from functioning. The Japanese media reported stories like Obama being denied the red carpet welcome at the Chinese airport, but the performance at the evening gala is perhaps another talking point. China noticeably puts on the kind of performances that evoke the days of the old Imperial China, such as the way it uses the Imperial Palace for ceremonies with foreign leaders as in the days of the Qing Dynasty or the way Xi Jinping welcomed the leaders of member countries at the latest summit in Hangzhou. The great power image China seeks to convey is understandable and it is not unusual for a host country to put on a performance based on its own culture. However, China needs to demonstrate “reciprocity” if it wishes to act as a superpower; that is, it must respectfully consider how such actions are likely to be interpreted in the international community. Shin Kawashima is Editor in chief of Nippon.com, professor of international relations at the University of Tokyo, and senior researcher at the Institute for International Policy Studies. Jiang Yuechun of CIIS gives an overview of China's most important diplomatic event this year. The US, Japan and the South China SeaThe US Is Pushing Back Against China. What Happens If We Succeed?On Looming US-China Trade Deal, Actions Speak Louder Than WordsAmerica's China Bashers Are Gaining SteamChina Won’t Join the INF Treaty—But Can It Forever Dodge Arms Control?